An ancient Native American remedy for all kinds of ailments, witch hazel has become a must-have natural skin care product. In addition to keeping your skin young and beautiful, witch hazel is one of the most useful first aid items to keep on hand for all kinds of injuries and illnesses. A study published in the Journal of Aesthetic and Clinical Dermatology showed witch hazel to be one of the most effective acne treatments of 52 products. It slows bacterial growth and speeds up healing of scabs, while reducing inflammation, redness, oil production and development of blackheads and whiteheads. Witch hazel’s anti-inflammatory and antioxidant properties help protect collagen and skin elasticity just as well or better than many commercial beauty products. You can easily blend witch hazel with vitamin E oil and other natural ingredients to make your own Homemade Anti-Aging Serum. Combine it with other skin-saving oils like evening primrose, frankincense and tea tree oils for even better results. A study published in Chemical Research in Toxicology found the polyphenols and tannin antioxidants in witch hazel reduced free radicals and prohibited the proliferation of melanoma cells. Witch hazel’s astringent properties make it effective at reducing pain, stinging, swelling and allergic reactions to bug bites. It’s also used in many commercial bug repellents. Witch hazel reduces oil build-up, leaving your hair shinier, healthier and more volumized. As an effective antibacterial, witch hazel is an excellent natural ear infection remedy. It’s especially great for “swimmer’s ear.” Just insert a few drops in each ear several times a day. Sipping Smallflower Witch Hazel Leaves – Cut (Hamamelis virginiana) Loose Herbs, 4 ounces can soothe a sore throat. Its astringent properties fighting infection, while soothing pain. Witch hazel helps heal blisters, sores and infections on your lips, inner cheeks or gums and freshens breath. You can apply it directly or add it to a homemade mouthwash. It’s also great for toothaches and teething infants. If you were using it for bug repellent…. would you need the alcohol free? I mix my wn bug repellent oils with witch hazel. Shake and spray. Great article! 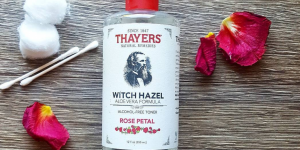 I love witch hazel and use it as one of the primary ingredients in my facial toner. You can check it out at https://preservingmysanity.com/2018/04/10/natural-facial-toner/ if you’d like! Thank you for sharing your knowledge of Witch Hazel astringent for all of us who can use it. Any pharmacy and its cheap! I buy it from the Supermarket and have been using as a toner for the past 20 years. I have used witch hazel for years on my face every morning. It works wonders on scratches and small sores. I’ve used witch hazel for fire ant bites…soothes immediately. Irritation and pain,itch gone! What would be the recipe for using it with Vitamin E and other essential oils? Witch hazel has been used by my family for many years. I never knew this deeper story though, or that one could grow it themselves! Thank you for sharing this knowledge with us. A dermatologist told my teen age daughter to use for acne. He told her she could go buy one of the fancy named products that cost lots of money or just get a bottle of Witch Hazel and it would do the same as the expensive product. He was right it worked like a charm. I don’t understand why witch hazel is credited with doing all these things. Ive tried several different brands and it won’t even clean my face. My face literally feels grimy when I’m done. The feeling I get when I wipe my face with it is it won’t even penetrate the surface of my skin whatsoever. I grab a cottonball with some rubbing alcohol or even plain water and you can visibly see all the dirt the witch hazel never touched. Ive tried it for other things it’s supposed to be good with with the same 0 results. So how come people claim this stuff works? I cannot speak from experience, but I believe not harmful.